Similar to a pot pie with ground meat, cheese and vegetables, this hearty dish is from NW England and Scotland. 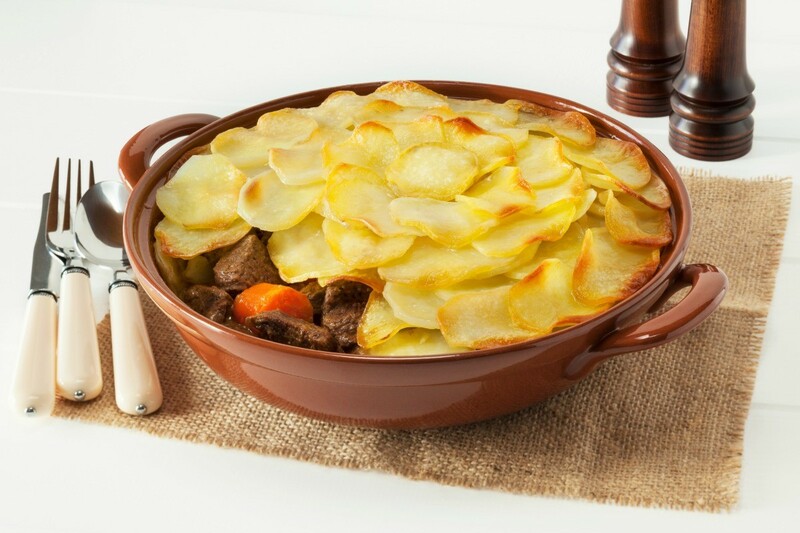 It is also called Lancashire hotpot. This guide is about making Scottish hotpot. A great dish for family on those cold nights. Easy to prepare and cheap. Mix the egg, mince, chopped onion, breadcrumbs and Dijon Mustard all together in a bowl. Once mixed, roll into approximately 16 meatballs. Add water to a medium pot and fill about 3/4 full. Put on stove, add meatballs and start to simmer. While simmering add carrots, peas and chicken cubes and stir until nearly cooked. Add flour and thicken mixture to your consistency or liking. When finished pour all ingredients into a large casserole and then Cut the French bread into slices and lay over top of mixture until covered. Sprinkle grated cheese over the Bread sticks to cover and then place in an oven at 180 degrees C (350 degrees F) for about half and hour or until cheese is melted and has a nice brown crust on top. Enjoy, you don't need anything else with this meal and great the next day too. Source: This recipe is my mother's and my own. No books or magazines involved, just great home Scottish cooking. What do you mean by "minced meat"? What is it? Where I grew up some of the people referred to bologna as "minced ham." I don't know if that is what was meant by "minced meat," but I have a hunch it might be. That is just ground beef or lamb. Any finely cut up meat should work fine.